Shuck one is from the very first generation of french graffiti artists, as early as 1986 he invested the capital's walls and underground arteries. His name can now be seen everywhere on metro lines 2, 9 and 13. He very quickly became known as the "king of the subway", these being the most used lines of the parisian underground network. In 1990 he founded the basalt association, a collective of parisian graffiti artists whose creative power and energy left an indelible imprint on the decade: as the whole city watched on, street art earned the respect it deserved. By 1991 this new form of creativity was widely hailed at the "10 years of graffiti art" show at the Chaillot Palais which brought together all of the great french and american names in graffiti. Up to 1995 basalt placed their truly french identity at the forefront of the scene through numerous collaborations and events in France and across Europe. 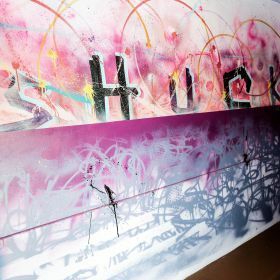 Whilst shuck one's paintings now begin to explore supports outside of the urban space, they still concentrate most of all on human and social preoccupations. Whilst he seeks to maintain the individuality of the artist in its place at the centre of the artistic act, his work truly aims to break down frontiers and socially and culturally liberate the individual.